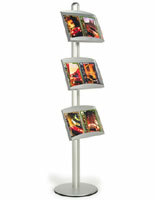 Snapframes.com has this 4 Pocket Brochure Stand made with heavy duty, quality construction. 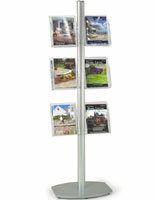 This heavy duty FORTE brochure stand features 4 steel pockets that can slide up and down the pole to adjust to your desired height. The base of this display is a brushed aluminum pole with a channel that runs down two opposite sides to allow you to adjust or change your accessories. 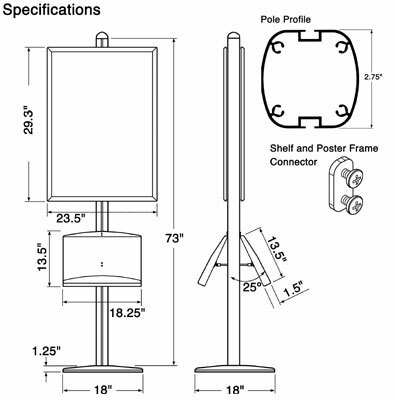 Each shelf has a connector arm that positions your shelf at a 25 degree angle out from the pole to allow more visibility to customers. 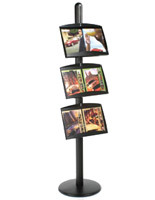 The entire display mixes an attractive and sleek look with a design for heavy traffic and repeated use. Each shelf measures 18-1/4" wide so you can easily place two stacks of standard size literature or magazines side by side. The double size allows you to insert larger sizes of literature as well. 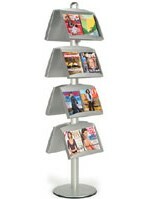 Companies that prefer to stand out with irregular or unique size literature will find the large pockets on this brochure stand to be quite fitting. Every aspect of this display was designed with high quality in mind. The FORTE heavy duty pole and base weigh 25lbs, the sturdy steel shelves are powder coated to prevent paint chipping and the rim of the base is covered with rubber to prevent scratches to the floor. 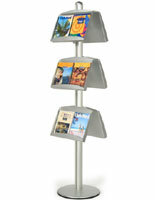 This brochure stand is not a cheap flimsy display, it will hold up to repeated use and wear and tear. To install your shelves, remove the top pole cap, loosely attach the connector plate to your literature shelf, slide the shelf arm and connector into the groove, slide the literature shelf down to the desired height and then tighten the screws. Note: This display is only designed for indoors use.